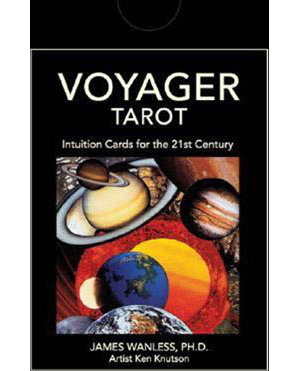 The Voyager Tarot Kit is the oracle for the 21st century. Voyager is a timeless symbology beyond any tarot deck. Experience the power of the symbols. Pick a card a day and change your life! Voyager Tarot shows you how to achieve your visions and dreams, creating the success you desire. Use the deck as an intuitive guide to forecast your future, reveal secrets of you subconscious and provide spiritual inspiration. This excellent decision-making tool can help you navigate life, enhancing business planning, relationship building and self-discovery. Even if you have never before delved into the mysteries of the tarot, you'll find the Voyager Tarot deck enlightening and easy to use. Just by playing with the cards and experiencing the beautiful imagery, you create a space for magic to happen, sparking your imagination and intuition.